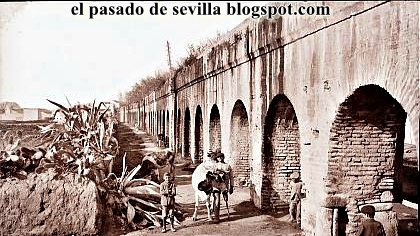 Home » Blogs » Sevilla4Real's blog » The aqueduct which provided Seville of water until the 19th Century. The aqueduct which provided Seville of water until the 19th Century. The origin of this engineering work is from the Roman Empire period. It's said that probably from the time when Iulius Cesar was in love with Híspalis and was focused on improve this city. When the Visigoths times arrived, the maintenance of the aqueduct was totally abandoned, including the channels that were blocked and stopped working. During this period and part of the Muslims period the city was provided with healthy water that extracted from wells dug in the banks of the river, where the tide didn't reach. Until Almohad dynasty, with Abu Yusuf Yaqub, the responsible caliph,who decides to repair the aqueduct to end the water problems of the city. So the aqueduct was repaired that was found by a coincidende meanwhile they made some urban works, and also inside the city were built large water tanks where they would store the water brought to distribute it in different public fountains and important buildings. In fact the name of "Caños de Carmona" is wrong, because the water didn't come from the town of Carmona. The water of this aqueduct came from natural springs in the Cercadillos de la Huerta de Santa Lucía, in Alcalá de Guadaíra. The length of the aqueduct was approximately 17.5 km, and a large part (13.5 km) were underground, until arrive atTorreblanca. That's why it was called "Caños" and "de Carmona", because the aqueduct itself ended at Puerta de Carmona. HOW WAS IT MADE AND WHERE WAS UBICATE? The aqueduct was constructed approximately with 400 arches, some of them doubled by the natural grade in some sections. The written documents that are conserved are of the aqueduct Almohad, so evidently it was built in reused stone of the Romans, brick and ceramics. It bifurcated at the height of the current Luis de Morales street to go to the Buharia palace and from there it continued to the Alcázar. The main part continued to Puerta de Carmona, where it connected to the wall of the city and stored the water in the water tanks that were located in the old Roman forum. UNTIL WHAT DATE IT CONTINUING WORKED? By the natural slope produced from Torreblanca to Seville, the aqueduct was able to work perfectly until the 19th century, which was pulled down in 1912 due to the request from the neighborhood, because the arches of the aqueduct was used as a refuge for criminals and homeless who disturbed to the people of the neighborhood. By the disastrous condition that it presented in some areas, they decided that "the aqueduct had little representative cultural interest". Currently there are only three sections: One in the "Pajaritos" neighborhood, at the crossing with "Ronda del Tamarguillo"; another on "Luis Montoto Street", and the third appeared when the Carmona bridge was demolished in the works of the early 90's years, and are part of the remains that crossed the Targarete stream as it passed through the "Puerta de Carmona". A part of the wall is also conserved by the "Callejon del Agua", which is the most modern part of the aqueduct because it's conserved inside the wall with ceramic pipes that carried the water to the Alcázar, and that flowed into the current Mercury Pond. 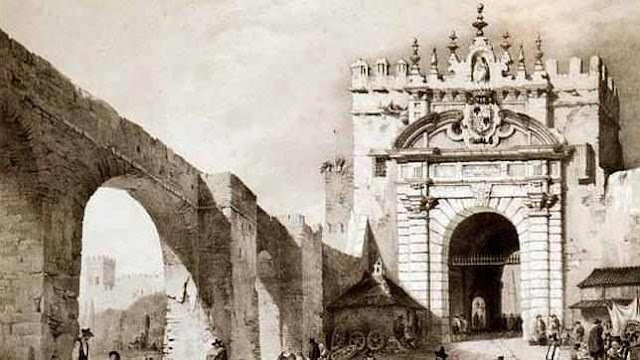 It's said that probably if it hadn't been demolished in the 19th century, Seville would have retained the longest Roman aqueduct in Spain, more than the Segovia aqueduct. TOP 5: NOCHEVIEJA DEL MUNDO.